Worldly Muslimah: Why can’t a Muslim Woman Marry a non-Muslim Man? I have not been able to write in a while, but I had no idea that it has been this long! My last posts was way back in January. Anyhow, hopefully I will start blogging again. Here are some quick thoughts I had; thought I'd pen them down in this blog before I lost my motivation to write, which has happened rather frequently the past few months. 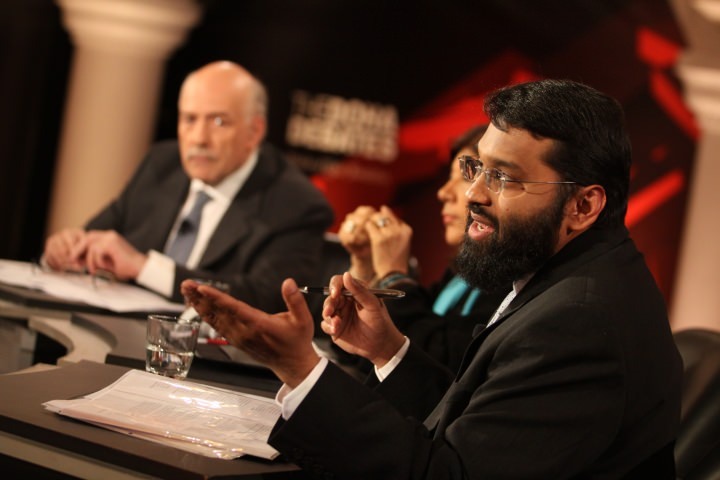 A friend had called and told me that an interesting topic on Muslim women was being debated on the BBC show - The Doha Debates. I only managed to catch the last 20 mins of the debate - should Muslim women be allowed to marry non-Muslim men - but it was sufficient for me to get at gist of the topic. At the end, over 60% of the audience voted that Muslim women should be allowed to marry non-Muslim men. It was not defined exactly what "allowed" translated into - but I imagine it entailed broad societal acceptance. I would sure like to know the exact make-up of the audience - it appeared to me from the audience speakers that there were quite a bit of young Muslim people (both men and women from various countries) so the high percentage was notable. Towards the end of the debate, a Muslim girl from the audience very eloquently explained why Muslim women, who have been raised in Muslim households and educated, are intelligent enough, and should be trusted to make the right decision without facing any opposition from their families. It all sounded very positive. Only this fact still remained: a Muslim woman who was raised and educated in a Muslim household, would also know very well that no less than the Quran (2:221) states that believing Muslim women should not marry non-Muslim men until the men become believers (Muslims) themselves - ie. belief in the Oneness of God and the message of the Prophet. One of the minimum requirements of Muslim belief is the acceptance of the Quran - words of God. Surely, these individual(s) based on their own desiresdo not want Muslim society to be forced to alter the word of God? How presumptuous? But that is exactly what is happening all around, on a variety of issues from drinking of alcohol to homosexuality. All of it in an effort to be humanistic, and all-accepting. As if one cannot be that while still retaining to your concept of the truth. People who do not practice the religion, but vehemently claim the label for themselves do nothing but corrode the essence of relgion. This isn't about being too rigid, or old-fashioned. It is simply this - if one chooses to be a Muslim, to have conscious acceptance, then one also has the responsibility to accept and try to live a life based on its dictates. Not every believing Muslim would be unfailing in this endeavour - I am no exception - but at least believing Muslims should have the decency to not force or demand that a wrong (religiously speaking) be turned into a right to bolster one's individual divergent choice. Not every single individual act needs the seal of approval from the larger society. If approval is needed, seek it elsewhere where it is to be found. I actually have a question about your blog. Would you mind helping us with a linguistic research project? We're compiling data from various Singaporean weblogs. All it requires is checking a few boxes. If you want to take part and/or have more questions, I'll send you the 'official' project eMail. We'd really appreciate your help. It is because the interference of one's "Nafs" (desires) that inspite of calling oneself muslim, educated want to change the word of Allaah (there's no God but Allaah). Hence it is the Sunnah of Allaah Himself and the Sunnah of his Last Prophet Muhammad (Sallallaahu Alaihi Wasallam) that their first area of work was human's heart to put faith of Allaah and his Prophet in it. And when that happened everything was easy for the Prophet's Sahabah to accept every order given by Allaah through his Prophet (PBUH). And not just the last Prophet but all the Prophets of Allaah starting from Adam (PBUH) to Hazrat Isa (PBUH) followed the same rule of lighting the sparks of faith into humanbeings...and this would be the rule till the Qayamat (the last day).